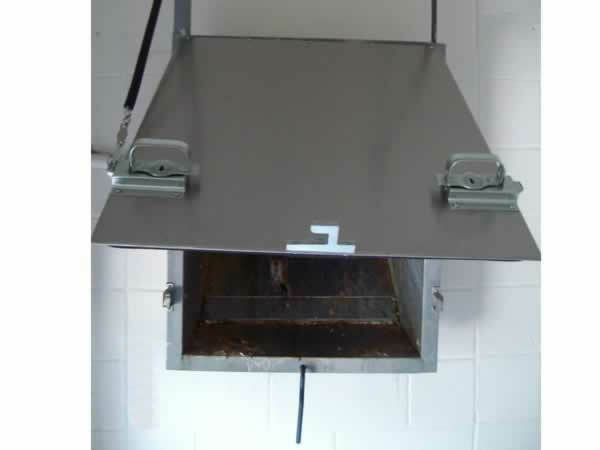 Type A rolling discharge fire damper door. Gravity driven. B Label construction, 1 1/4 inch thick panel with 165 degree fusible link assembly. Initial fire protection for any trash chute. Available in many sizes, call to order. Type H Linen Chute Discharge Door. Top-hinged, self-closing, hopper door with self-latching hardware. Held open by couter balance assembly with 165 degree fusible link. UL 10 B, 90 minutes, rated Discharge Door with 250 degree F. max temp rise over 30 min.